The Oly Mountain Boys | Pacific Northwest Bluegrass | Blog : White Horse FUNDED with 6 days to go! Thanks to all our backers! White Horse FUNDED with 6 days to go! Thanks to all our backers! YOU DID IT!!! You funded "White Horse"! THANK YOU to every single one of you who backed us over the last 3 weeks! We are really excited to be able to bring this project to you. We're going to have a great time putting the finishing touches on the music, writing, design, and layout over the next few weeks. We can't wait to have it in our hands and tie everything up in a package meant for each of you. We hope you'll all encourage other bluegrass lovers out there to continue pledging over the next 6 days. 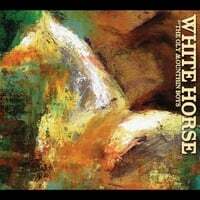 Not only is it the best way to make sure you get a copy of "White Horse" right away, but with a little bit bigger budget we'll be able to consider hiring a promotional company to distribute the album to radio stations and press contacts, to make sure it gets heard widely by people who don't know about the Oly Mountain Boys... yet! Plus, it's the best time to get your hands on a t-shirt... not to mention getting us to your backyard barbeque this summer with a house concert pledge! THANKS ONCE AGAIN TO ALL OUR BACKERS! FRIDAY, MARCH 21st, 9pm, $8/$6 student - Royal Lounge with HILLSTOMP!, Olympia WA. SATURDAY, MARCH 29th, 10pm, $15/$12 advance - Olympia Acoustic Music Festival, Olympia WA. SATURDAY, APRIL 12th, 7pm, $5 - Jeremy's Farm to Table, Chehalis WA. SATURDAY, APRIL 26th, 9pm, $5 - AndyinOly Presents Artswalk with the Oly Mountain Boys & The Blackberry Bushes, Olympia WA. Details to come!